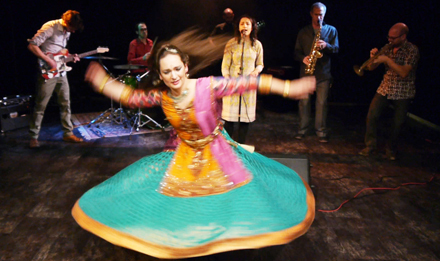 In 2014, Spinifex presented BOLLYCORE, a project featuring Priya Purushotaman, one of India's most talented young vocalists, and virtuoso dancer Maya Sapera. The trademark Spinifex jazzcore/avantrock combined with Purushotaman's intense lyricism to create a sound beyond East and West, avantgarde and tradition; a sound previously unheard and thoroughly enjoyable for lovers of Indian music as well as for fans of contemporary jazz. The visual aspect of BOLLYCORE was greatly enriched by the performance of Maya Sapera, who has a background in Bharatanatyam (south Indian classical dance) but who is also expert in Rajasthani gypsy dance and Bollywood styles.